Being able to do the flutter kick is an important prerequisite for learning the front crawl / freestyle stroke. The following article explains the movements of the flutter kick, and also proposes a few exercises to learn this technique (video included). 1) Let’s imagine that you are floating in the water in a prone position, with your legs extended and feet pointed. 2) To flutter kick, alternate kicking downward with one leg, a bit like kicking into a ball, while moving the other leg upward, and vice versa. 3) Start the downward movement from your hip. Slightly flex your knee while moving downward. The water pressure pushes your foot in an extended position. Straighten your knee at the end of the downward movement. 4) Now during the upward movement, the water pressure will straighten your leg and push your foot in a half-flexed position. 5) The propulsive phase of the kick occurs during the first half of the downbeat. The following drills can be used to learn the flutter kick. They are demonstrated in the video further below. 1) Hold onto the pool’s wall (or a pool lane marker). Push off the ground, and start to kick up and down alternately. Make sure your toes are pointed. Keep your head above water. Feel how the kick pushes your legs and hips upward. Straighten your arms while holding onto the pool wall until your body is horizontal and fully extended. 2) Repeat the previous exercise but now put your head in the water, so it is in line with your body. Try to get as horizontal as possible and feel how you can use a lighter kick to float. Stop kicking when you need to breathe. 3) Repeat the previous exercise but now try this: as your body gets horizontal, feel how you need to hold onto the pool wall less and less to support your body. Try to become balanced up to the point where you only need to hold onto the wall with your fingertips. Then let go of the wall. Keep kicking and feel how you are floating in perfect horizontal balance. 4) Push off the wall in a streamlined position: Your arms are extended forward, and your hands are on top of each other. Your head is aligned with your torso. Try to be balanced, as you practiced in the previous exercises, and try to glide as far as possible, until the momentum stops. 5) Repeat the previous exercise, pushing off the wall and gliding in a streamlined, balanced position. Start to flutter kick while gliding to maintain momentum. Continue to kick and maintain balance until you need to breathe, then stop. 6) Grab a kickboard and hold it forward at arms’ length. Assume the same horizontal position as before and use the kick for propulsion. Keep your head above water. Do short repeats. 7) Repeat the previous exercise, but now keep your head in the water, in line with your body. To breathe, raise your head, then drop it back in the water. Exhale slowly in the water while kicking. This exercise is easier for your legs because you are balanced, but harder on your lungs because breathing is restrained. 1) You can use a swim snorkel, such as the Finis Swimmer’s Snorkel, to make breathing easier while practicing. 2) The power in the kick comes from your hips, not from your knees. Your knees should only bend slightly during the downbeat. Think flutter kick, not bicycle kick! 3) If you have stiff ankles, it could be difficult for you to point your feet. If so, using swimming fins regularly can improve the flexibility of your ankles. My preference goes to short fins like the Speedo Biofuse fins, because the kicking movements are more natural with these than when using longer fins. 4) If your hips and legs still drop while flutter kicking, it could be your upper body is positioned too high in the water. Push your chest and head a bit down. Your body will act like a seesaw, causing your legs to rise. 5) If you still have trouble finding your balance in the water, a friend giving feedback and correcting your position can be helpful. This seems an excellent video. I am just learning freestyle. Finding it difficult. Hope this works, I will keep you posted. I’m learning to swim and I’m finding totally difficult to alternate front and backstroke without drinking lots of chlorinated water, enough to drown. I’d suggest practicing the balance drills in the front crawl and backstroke drill series. Would like to see view of leg action from under the water line. My son seems to be stuck doing a semi-scissor kick while swimming freestyle. Do you have any tips or drills that would help correct the habit? I think it would be useful to regularly do some laps with short swim fins (Zoomers), keeping the kick quick and compact. Using a six-beat kick instead of a two beat kick can also help, as your legs don’t move apart so much with a six-beat kick. Finally, your son could also get into the habit of having his big toes brushing along each other during the kick, which helps keeping the kick more compact. I learned to flutter kick and I am able to glide underwater holding my breath. But as soon as I try my hand movements, my legs stop and the lower body comes down. Also, I am not able to raise my head above water while gliding. Can you get hold of a pull buoy or kickboard that you place between your legs so that you can practice the arm movements without being concerned about the legs? Once you have learned the arm movements, you can try again to do them with the flutter kick. It is not mandatory to be able to lift your head while gliding, because normally in front crawl you breathe on your side. A swim snorkel could help you to practice the arm movements and breathe normally, without needing to lift your head or to roll on the side. 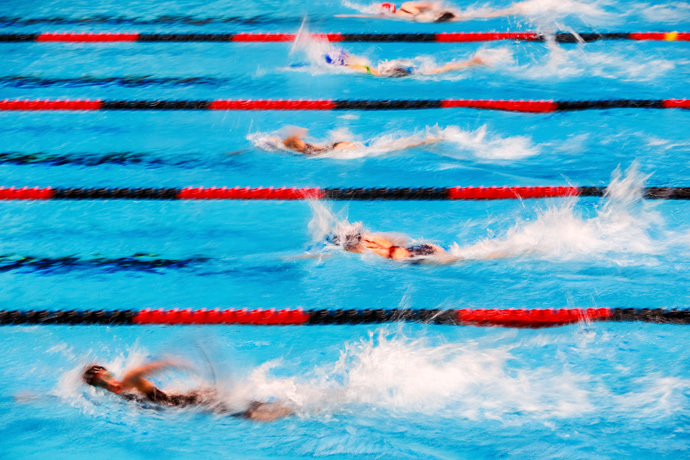 But in my opinion, the best way to learn front crawl is to follow the sequence of drills as proposed on this site, especially now that you have mastered the technique of flutter kicking. How much time should we spend on the drills? Could one hour (or similar) in the pool be enough for each set of drills (for instance all the points 1-7 above), or should we spend more time on them (for instance one workout per point) even if it feels good? Any advice on how much time to spend on each drill and each set of drills? If you are able to do the drills and flutter kick with good balance after an hour, you can move on. If it takes longer, so be it. This is not a competition but also no need to dwell on these drills longer than necessary. As you have written, the important thing is to be able to flutter kick with ease and feeling good, then you can move on. I am currently working on the flutter kick drills outlined in the video. I’m able to float when I fill my lungs up with air and hold my breath but sink when I exhale. How does this help with swimming? Based on what I have read it is bad to hold the breath while swimming and a swimmer needs to exhale most of the time and inhale for a short amount of time. The problem is my body sinks when I exhale. I have been practicing the flutter kick drills (holding side of pool and using a kick board) and can do the flutter kick for a short amount of time when my face is in the water but when I lift my head to take a breath, my legs sink and touch the bottom of the pool. What am I doing wrong and what corrections do I need to make to learn to float while exhaling and float when I lift my head to breath? You are correct, it is recommended to not hold your breath while swimming, for different reasons (relaxation, elimination of CO2, timing, etc.) but this is more a rule for lap swimming than for drilling, where in certain cases you’ll have to hold your breath a bit. Now when you lift your head in the flutter kick drill with a kickboard as described above, it is normal that the legs drop. In fact, I kick a bit harder when I lift my head, and I also push my chest and head back in the water as soon as I have taken a breath so that the legs rise quickly. So the last drill is a bit tricky and requires some practice. On the other hand, you don’t absolutely need to master this last drill, as normally in front crawl you breathe on your side and not to the front. I have aquaphobia and have just enrolled in swim lessons. I am simply unable to let go of my feet touching the bottom of the pool. What would help me get over this? Could you provide us with more details? What is the depth of the water? Is it clear water? Are you using flotation devices? I have been learning for quite some time but just can’t do the flutter kick with the legs on the surface of the water. Every time I try it no sound is heard. I don’t know what’s wrong. Normally your feet should barely break the water surface, especially when swimming at a moderate pace. If your feet cause a lot of splashing or make a lot of sounds, you are in fact wasting energy. The exception to this might be while sprinting, where you can waste energy and kick hard because you only do short distances. No, no, no!!! Do NOT use a pool lane marker to hang on! I can’t believe you guys recommended this. You’re setting up your students to get yelled at by the lifeguards. I understand what you mean. If there are people swimming in the lane and the lane marker line is pulled down, it can be annoying for those swimming. So this should only be done when the pool is not too busy and you don’t get into the way/annoy of other swimmers. I can kick alternately but when I try to lift my arms up to stroke my legs stop kicking. Can’t seem to coordinate my arms and legs. This is most likely because you are a beginner and have to exert conscious effort to both kick and stroke at the same time and when you focus on one movement the other one stops. A short-term crutch might be swim fins, as with those you need to kick less to keep your legs up. But the best approach would be to practice the sequence of swimming drills in the “learn to swim” section, as then you’ll seamlessly and progressively integrate kicking, balance, and the arm stroke.